Funding News | Meniere's Research Fund Inc. 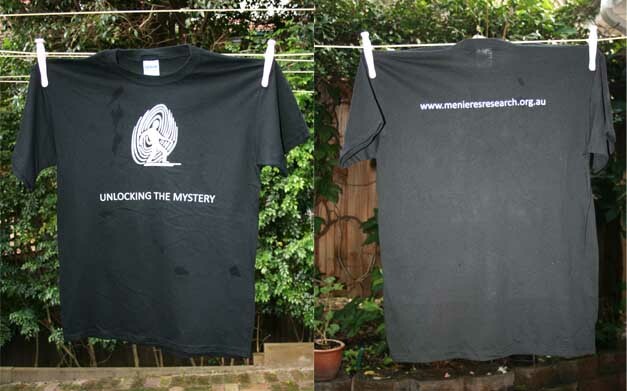 The Fund has 100 quality pre-shrunk cotton T-shirts emblazoned with our logo donated to us. Like T-Fords, they only come in one colour – black- and sizes are limited. They are free, but there’s a catch. More than 150 people attended a fund raising evening and gala auction event hosted by the Fund and Balmain Rotary Club. With smooth music sounds supplied by “Doctor Wasabi”, attendees were entertained by the antics of Raymond Crowe, better known as the “The Unusualist”, whilst they feasted on a mouth-watering 3 course dinner and drinks. The night featured the Melbourne Cup theme with prizes and raffle draws and culminated in a live auction where attendees feverishly bid for holidays, jewellery, sports memorabilia and artworks. We are pleased to announce that over $45,000 was raised, to be carefully expended at the Fund’s Menieres Research Laboratory at the Brain and Mind Institute, Sydney, the only research facility in the world dedicated to finding a cure for Menieres. Fund raising dinner and auction – 3 November 2010 – please join us! An application to Garnett Passe for funding of a PHD graduate has been granted to the Fund. Garnett Passe will provide salary funding for 3 years for a medical graduate to complete a PHD to into the effect of salt on the inner ear. The committee recommends that the Department of Health and Ageing works with Meniere’s Australia to identify opportunities for research into the prevalence of the Meniere’s disease in Australia, rates of diagnosis, options for treatment and personal management, and the socioeconomic impact of the disease, including on the employment and lifestyles of those affected. What’s happening at the Fund? Professor Bill Gibson and Dr Daniel Brown successfully apply for $50,000 research grant.